This year marks the 50th anniversary of the Space Science and Engineering Center (SSEC) and 100 years since the birth of Verner E. Suomi. In recognition, our summer issue of Through the Atmosphere celebrates the pioneering accomplishments of SSEC during its first 50 years and foreshadows the innovations of the next 50. The serendipity that these two monumental milestones, 50 and 100, should take place in 2015 is appropriate for SSEC, the progeny of both national and international forces as well as Suomi’s rare mind and personality. At the 30th anniversary of Sputnik in Moscow, Suomi acknowledged that the stimulus for advancing space-borne technology in the United States was fueled by the success of the first man-made satellite. “Spasibo Sputnik!” Suomi exclaimed, expressing his gratitude to our Soviet hosts. Yes, thank you for getting us motivated. The first article in this issue, Noteworthy Beginnings, summarizes how Suomi and others “took their bravery pills,” using the resulting momentum to found SSEC and to convince the State of Wisconsin, NASA, and the National Science Foundation to support the 15-story building that has been SSEC’s home on campus for most of those 50 years. 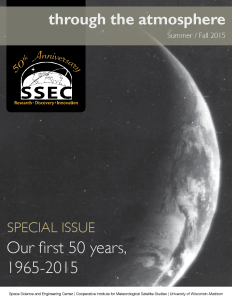 The heart of this issue is a chronology of advances and applications that characterize SSEC’s accomplishments over the decades. It is interesting to note that many of these activities have grown from Suomi’s own work: his early exploration into net flux measurements (studying the energy budget of a corn field for his PhD thesis), his extensive space-borne earth radiation budget observations with both spherical and flat plate radiometers, his spin-scan camera imaging concept, geosynchronous time sequence imaging for wind measurements, and geostationary temperature and water vapor sounding for quantifying severe weather threats. One thing often led to another. The desire to track clouds that were visible in satellite images led to advanced computer processing techniques, the direct acquisition of volumes of satellite data so necessary for research drove advances in data archiving, and efforts to improve the vertical resolution of satellite sounding products resulted in a new standard in accuracy for infrared radiances. cosmology, and geology, in addition to atmospheric sciences. The final article, Imagining the Future, summarizes some key concepts and approaches needed for continued success: For, as we know, the goal of providing society with better weather information remains a noble challenge. So, congratulations! And I hope you enjoy reminiscing. I think our 2015 celebrations of the last 50 years will be inspirational and help remind us that tackling the challenges facing us in the next half-century will be equally as exciting and very rewarding. Read more in the special anniversary issue of Through the Atmosphere, Summer/Fall 2015.